Better Buy: Intel or TSMC? Each is a chipmaking powerhouse, but their businesses are very different. If you're looking to add a major semiconductor stock to your portfolio, then it's likely that you've at least considered both Intel (NASDAQ:INTC) and Taiwan Semiconductor Manufacturing Company (NYSE:TSM). Intel is the most valuable publicly traded semiconductor company in the world, with a market capitalization of around $265 billion as of this writing. TSMC is up there, too, commanding a market cap of roughly $194 billion. The fact that both chipmakers are already so massive means their stocks are unlikely to double or triple overnight. However, stocks in the $100 billion-plus zone tend to have dominant positions in their markets, generate substantial revenue and profitability, and are often less volatile than their smaller brethren. Intel and TSMC are roughly similar in magnitude, but which stock is the better choice for your portfolio? Let's compare the companies across three important metrics. Predicting a company's growth rate is hard, but we can, at a minimum, look at their historical growth rates, as well as the growth forecasts they have put out. Over the last five years, TSMC has grown its revenues more rapidly than Intel has on a percentage basis. It's worth keeping in mind, though, that TSMC's gains were made off a smaller base than Intel's. Looking ahead, during its analyst day in early 2017, Intel said its plan was to deliver "low-single digit" percentage revenue growth over the next three years. Intel's revenues rose 6% in 2017, and based on its financial guidance, it's set to deliver 7.4% revenue growth in 2018. (Analysts' consensus estimate sits at 7.7%.) Currently, the analysts' consensus calls for revenue growth to slow to just 3% next year. TSMC, on the other hand, has told investors that it expects to see between 5% and 10% revenue growth each year over the long term. The company forecasts 10% revenue growth in 2018. In terms of revenue growth, I think TSMC has slightly more potential than Intel, so I'll give TSMC the win for this category. Considering that they're in the same space, the business models of these companies couldn't be more different. TSMC develops manufacturing technologies and builds production capacity, then makes its money by getting as many of the world's chip designers as it can to contract with it to build their chips. Intel, too, develops its own manufacturing technologies, but it doesn't build chips designed by other companies -- it designs and sells its own products. Also, TSMC only manufactures logic products; Intel builds both logic products and certain types of memory chips. TSMC's execution over the last several years has been nothing but superb. It has delivered new manufacturing technologies to market like clockwork, offering options across a range of needs: It can produce chips for low-cost applications as well as pricier models for premium smartphones and high-performance data center processors. TSMC's strong execution has allowed it to defend and, in many cases, even grow its market share. Over the last five years, for example, TSMC won nearly all of the chip manufacturing orders for Apple's iPhone. The company's upcoming 7-nanometer technology looks like it will be the first at that scale to reach mass production, which should further enhance its competitive position. Intel's technology execution, on the other hand, has been something of a train wreck. Its 10nm technology, which was originally supposed to go into manufacturing by the end of 2015, is still not in mass production, and isn't expected to be until sometime in 2019. Intel's poor execution has delayed its introduction of key processor technologies, and given its competitors ample opportunities to catch up to it. If it can't get its act together around 10nm soon, those rivals could pull ahead, which could in turn lead to substantial market share loss and, ultimately, a large drop in profitability. This comparison's not even close: TSMC wins by a mile. One nice feature of the largest technology stocks is that they often pay nice dividends, as both TSMC and Intel do. As of writing, Intel's yield is 2.21%, which is respectable to be sure, but TSMC's currently sits at around 2.7%. So, if you're looking for the stock that pays the better dividend, TSMC has the edge. 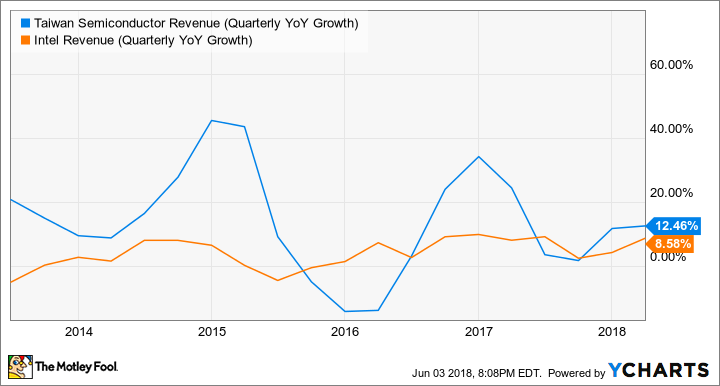 TSMC's growth prospects, product and technology execution, and dividend are all better than Intel's, which makes it the clear winner in this match-up. If I were going to invest in a major chipmaker today, I'd pass on Intel's stock and scoop up TSMC shares.